It’s been two weeks since I returned from my first WWDC and I’m just now making a post about it (I have a somewhat decent excuse involving being out of town for 8 days on a motorcycle trip). Was it worth it? Did I get out of the experience what I was hoping? Since this was going to be my first Stevenote, I wanted to be sure to get into the main room and not be stuck in one of the overflows; I wasn’t concerned with being close to the front, I just wanted to be there and be able to say “Yes, I did that”. I arrived at Moscone West at 6am—a full four hours before the keynote was to begin—to join the throng of attendees already in line, which started forming at about 9pm the previous night. A brief moment of hope was dashed when I realized what I thought was the end of the line was actually the line heading into the Starbucks beside Moscone West. Once everyone started filing inside, the line got dense, and I mean dense. No matter, we were waiting to bask in the Steve’s RDF! When the keynote began, it became clear it was going to be all iPhone, all the time. First the mere glancing mention of Snow Leopard, then the drawn-out iPhone software demos that just seemed to go on and on and on. With only half an hour left and no mention yet of pricing and features, there was definitely very little time left over for a “One more thing…”, and sure enough, we didn’t get one. Overall, the keynote was rather underwhelming. Really, if you haven’t yet watched the keynote stream, I wouldn’t bother unless you really want to see the whole presentation. Instead, check out Mahalo Daily‘s excellent WWDC Keynote in 60 Seconds to get the gist of what went on. 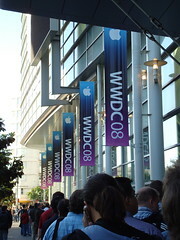 Oh, and the next time I’m at Macworld Expo or WWDC, I’ll be sleeping in and heading to one of the overflow rooms. I came, I saw, I attended; no more standing for 4 hours for me. I can’t comment on the labs as I didn’t have much code with me to take to any of the engineers (thus removing much of the benefit of attending the labs) so the sessions were really the meat of the conference to me. Some were great, filled with lots of useful information, while others seemed to miss the mark completely. The worst part was the session descriptions and titles weren’t always that helpful in giving you an idea what the sessions would be about.1 One of the better examples of this was the Core Data Tips & Tricks session that many people walked out of because it was far too basic (I’m told it started out with an explanation of what a relational database was). Overall, the sessions more than made up for the cost of attending. But everything that went on outside of conference hours is what really gives you your bang for the buck. From the sfMacIndie party the night before the conference began, to heading out with other developers for lunch and dinner, and just chatting it up between sessions, it was great to finally get to meet a bunch of the people I’d only thus far “known” (i.e. stalked) via their blogs and Twitter feeds. Plus, there’s the people–watching which is always interesting. You Mac developers out there, you’re a decent, friendly bunch, ya hear? Scott Stevenson‘s CocoaHeads WWDC was a great event and after seeing pictures of the crowd that packed into the San Francisco Apple Store to watch last year, I made sure to get there early. Myself and Paul Robinson wandered over more than an hour before it started and secured nice seats second row center. Aside from the informative presentations given by the speakers, including a very intriguing visual debugging methodology developed by Daniel Jalkut, the question panel at the end netted some good stories and more nuggets of wisdom. Tip for those wanting to get catch this next year (assuming it happens again, and Scott can’t find a larger venue): get there early! It could very well be that my tastes are not as sophisticated as some other developers, but the food provided during the lunches at WWDC was more than acceptable to me. Having said that, I didn’t always eat lunch at Moscone West and got to head to some fantastic eateries for both lunch and dinner such as LuLu, ‘wichcraft, Mel’s Drive-in, and probably the most upscale food court I’d ever been to just beside the Bloomingdales. I didn’t get to do this as much as I’d liked to have, but I got out and about a bit. 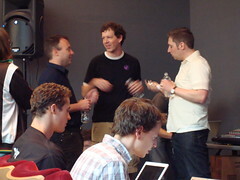 I even got interviewed by Scotty from the Mac Developer Network regarding the impending release of the iPhone in Canada. So, would I do it again? Unequivocally, yes.